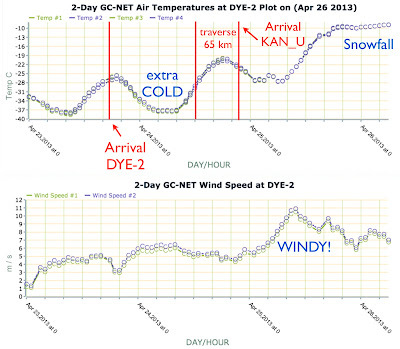 DYE-2 automatic weather station (AWS) data. I installed this station in 1996. 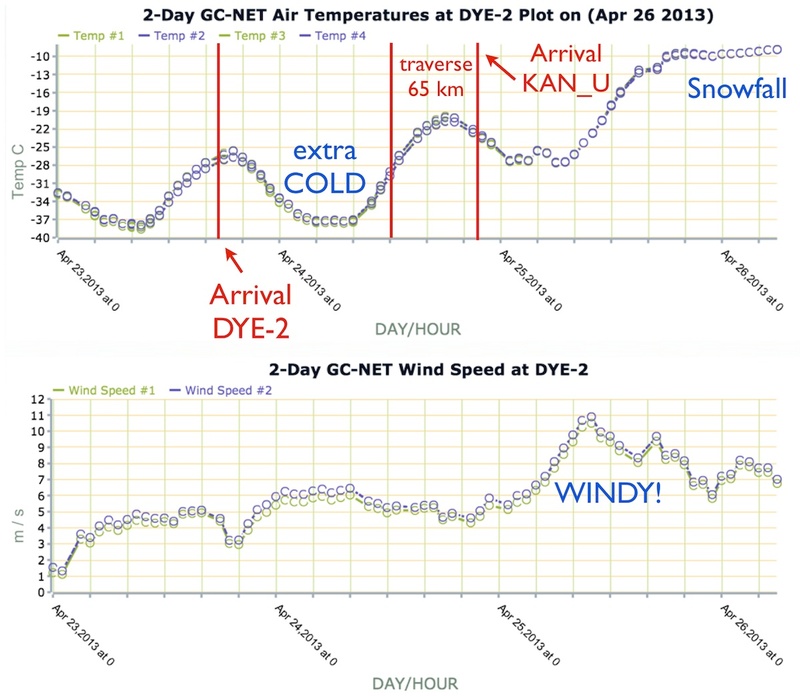 The data from the DYE-2 automatic weather station confirm the story Dirk relayed by phone; COLD on arrival, once arriving to KAN_U after 65 km traverse (taking the better part of a day) it was very windy. Hourly average wind above 10 m/s is plenty of wind to drift snow. The wind calmed and was followed by snowfall. The last I heard on the phone was that "the GEUS weather station..." CALL DROP [was running?] I really hope so. I also learned that the SMS I had sent replying to that I received did not make it. So, the SMS communicaitons seem one-way unless we text using the Iridium web site. Today is Horst's birthday. He is celebrating by having a cold, literally and figuratively. Get well Horst! Thanks for the update! I heard from Mike yesterday and he did indicate that the first couple of nights were bitter cold! Happy Birthday Horst! Also- seems Mike is having the opposite problem with SMS transmissions. He said he was able to receive my SMS messages but getting failure codes when trying to send...?